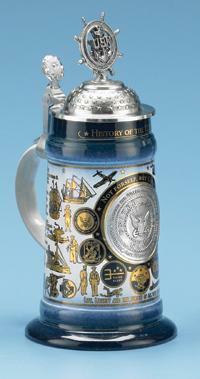 This stein chronicles the occupants of the office of President of the United States of America. 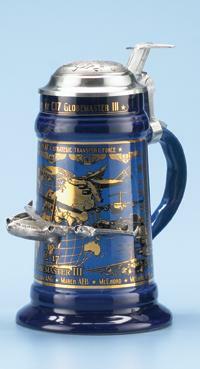 The body of the stein is blue glazed, high quality stoneware decorated with a gold wrap around design. Along the top border are the words, "The History of the U.S. 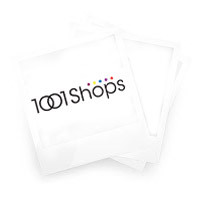 Presidents." The left side of the gold design features the first half of a timeline chronicling the progression of U.S. Presidents beginning in 1789 with George Washington and ending in 1892 with Grover Cleveland. Bordering the timeline are portraits of George Washington , The White House in 1800, the First U.S. Flag, Thomas Jefferson, Abraham Lincoln, Theodore Roosevelt, and Dwight D. Eisenhower. 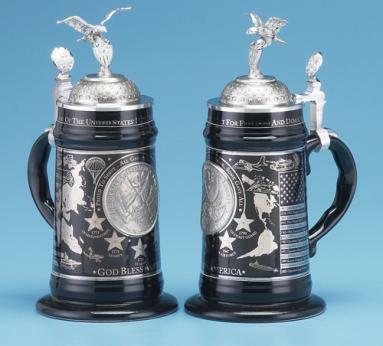 A pewter emblem with gold highlighting is situated at the center of the wrap around decoration featuring The Great Seal Eagle and The Shield of 1885. 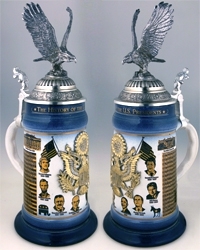 The right side of the gold design features the second half of the timeline beginning in 1896 with William McKinley and ending in 2008 with Barack H. Obama. Bordering the timeline are portraits of John F. Kennedy, The White House in 2009, the current U.S. Flag, Ronald W. Reagan, Bill Clinton, George W.Bush and Barack H. Obama. A detailed pewter eagle figurine with outstretched wings is fixed to a raised star patterned dome on top of the ornamental pewter lid. 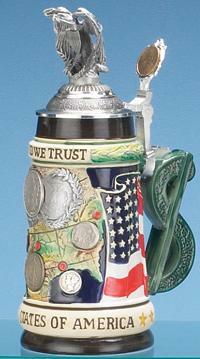 This stein is produced in a registered and individually numbered series of 5,000 pieces.